Simplify and automate, while ensuring control. Create, submit or approve expenses anytime, anywhere, on any device. Provide efficiency, control and savings. Increase AP team agility with fully mobile invoice management software that improves accuracy, expedites processing and increases spend visibility - all through a modern interface that finance teams and approvers love to use. Secondary review for better control. Provide a secondary review process to help catch errors and eliminate the potential for fraudulent activity. Deliver real-time metrics for actionable results. Deliver expense spend analytics and key operational metrics to enable control and cost savings, which makes CFOs and travel managers happy. Partner Engineering is a full service engineering and environmental consulting company with offices in the US, UK, Poland and Canada. 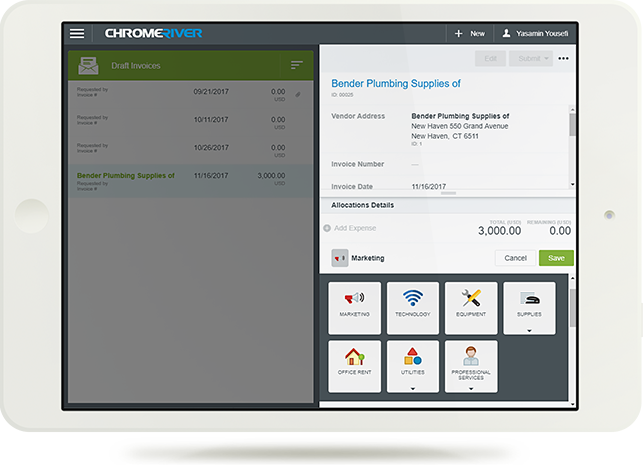 Watch this video to learn why the company switched from its current expense management provider to Chrome River. 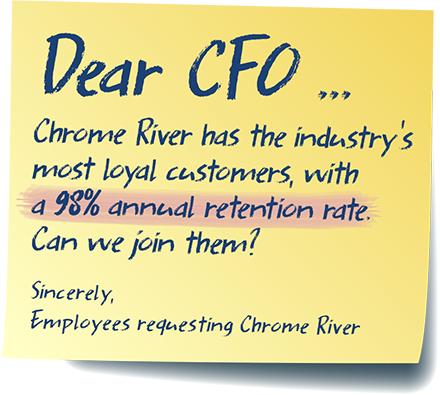 Team members enjoy Chrome River’s automated process and the reduction in time spent on creating expense reports and submitting them; and use their mobile devices for receipts and approvals, and most importantly, quick reimbursement. Health insurance provider Anthem recognized the need to provide a modern, integrated travel and expense solution for its thousands of employees. We are saving lots of time, paper, and tape by ditching the old "Arts & Crafts" process of submitting taped receipts in exchange for automation, insights, control, and happy associates. Travel budget growth is stalling and increasing numbers of organizations are cutting their travel budgets. As potential economic clouds are gathering, how can organizations avoid hampering their own growth by slashing team travel? It was recently revealed that a sophisticated invoice fraud scheme extracted more than C$150 million from two of the world's largest companies. What steps can AP teams take to avoid their own organization falling victim to scams like these? By integrating your PO data, you can match your invoices in your AP automation system to your ERP’s PO data – and more importantly, systematically identify when (and what) line item data does not match. Learn how this can be done and how it can be used to drive compliance in the AP process. Chrome River's director of product marketing, Barbara Doane, talks to Business Travel Executive magazine about how to make mobile expense reporting smarter. 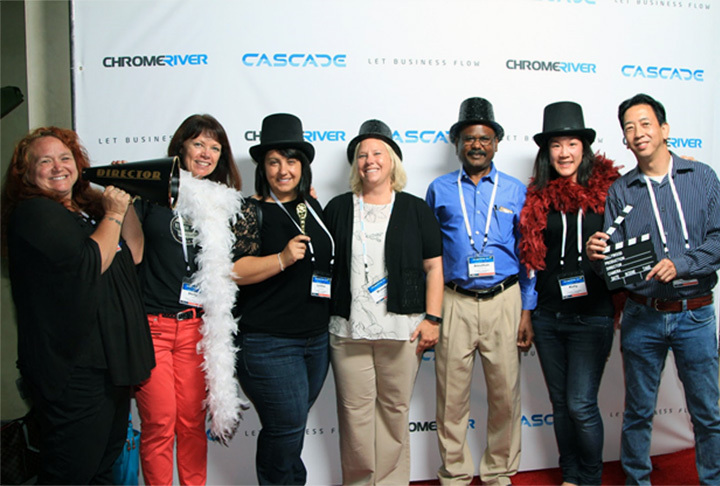 Comparably lists Chrome River among the 10 best places to work in LA. "Chrome River is among the most vocal proponents of using expense management systems to increase insight into business travel ROI. Get the latest expense management news & updates delivered straight to your inbox. How does a simple expense claim let business flow? When that expense claim gives business travelers and expense approvers the freedom to work anywhere on any device with one web app that never needs updating or downloading. Your phone camera gives you the freedom to Snap and Send receipts when and where they happen with smart OCR to virtually eliminate manual data entry. But modern expense management goes much further. It gives the CFO, the Finance Team, and Travel Managers complete visibility into global spend, expense policy compliance, all the way to the true cost of sales. With powerful spend analytics at their fingertips, executives can transform oceans of business expenses and invoice data points into visually-compelling and actionable reports. Can one expense management software do all that? Yes. When it is architected with the very latest technologies to remain agile and fluid. Chrome River solutions are completely configurable, so your organisation is afforded more choices for finance software and ERP systems, travel management companies, corporate card programs, and online booking tools. Your data integrations transform into your best-of-breed solution for your evolving business, not points of failure. These new choices plus Chrome River’s business rules engine means an end-to-end travel and expense management solution designed to fit your business and your standard operating procedures...not your business processes tweaked and jammed into pre-defined workflows. The same holds true for our invoice management software. Your invoice workflow rules are automated to fit your company protocols. This way you have complete visibility on invoices and purchase orders around the world and around the corner. With invoices matched, routed, and approved sooner, your firm can take advantage of better payment terms and turn the cashflow to your advantage. And by changing your business rules on a dime, you’re future-proofing your business. Now you’re free to grow organically, leapfrog with M&A, enter new markets - and your AP automation solutions will be right there with you. 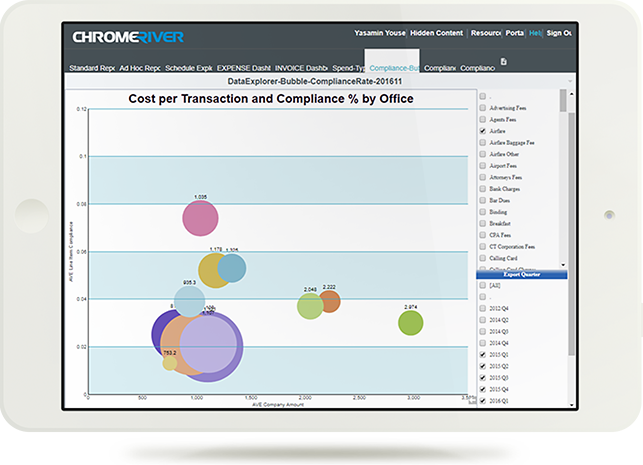 Customers around the world rave about Chrome River solutions because they are so easy to use and intuitive. The user experience is designed for our new mobile lifestyle where our expense report app and invoice processing app need to work just as beautifully as our favorite music app. And we have the implementation teams, customer support, and customer success teams ready to make your organisation wildly successful with the solutions. With new features introduced every two weeks, you’re never waiting for fixes or patches - and you never have to guess which platform or device has the latest features. With inline user tutorials, videos, and global tech support in your language, help is always just a click away. Chrome River is committed to delivering the best end-to-end travel and expense management software along with white glove service and support. Our global expense management solution will continue to deliver more languages, plus all 180 currencies, and country templates to make your international business travel easier. Our invoice management software will make life easier for your AP department by removing data entry tasks and allowing them to contribute instead to value-added initiatives. After all, you’re not just selecting a vendor - you’re choosing a business partner to grow with you. You’re choosing the expense reporting, invoice processing and expense management software your users will absolutely love.